Welcome to the Spectator GO! program tour. On this page you´ll find some screenshots which will give you an idea of some of the functions of the Spectator GO! software. First you configure the input template for the PDA (Subject names, behaviors etc.) and save this configuration with the help of the desktop software. Then you transfer the configuration file onto the PDA using HotSync©. Your PDA is ready for the performance of an experiment. At the end of an experiment, the data file(s) is (are) transferred from your PDA onto the desktop using HotSync. After having transfered data from the PDA onto your desktop, you can open your data with the Spectator GO! desktop software for further processing. This is the configuration page of the desktop software. This page enables you to configure the input template that you will want to use on your PDA for data generation. Under “Observed subjects” you can fill in the names of up to five subjects whose behavior you want to monitor. 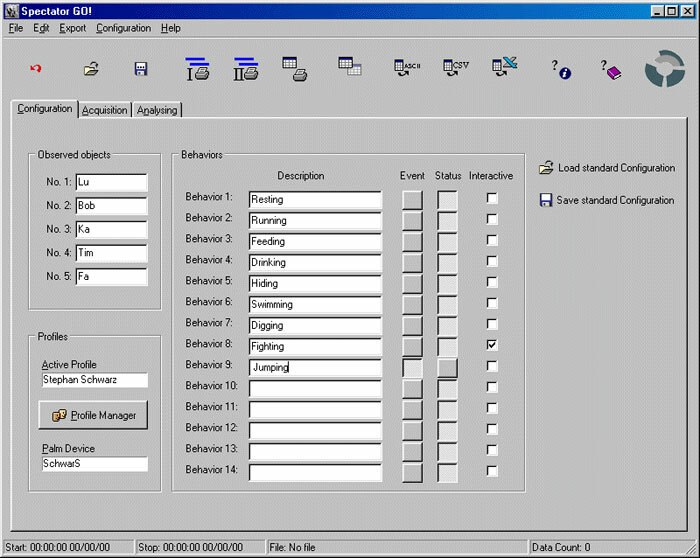 In the “Behavior” field up to 14 different behaviors can be inserted (56 in the Professional version). By clicking the “Event” or “Status” button for each behavior, you can determine each behavior as either a short (event) or a long lasting behavior (state). Check “Interactive” to designate those behaviors that can be observed between two subjects (e.g. fighting). During later data generation these interactive behaviors can be designated for both the active individual and the passive individual as well. 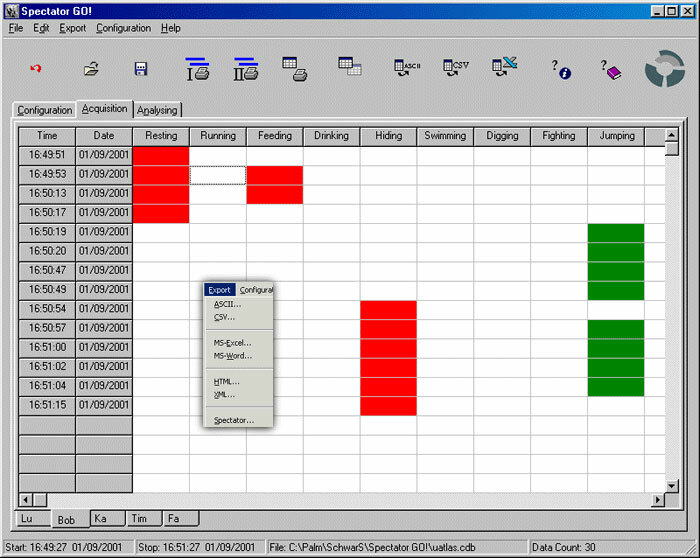 On the acquisition page in the main window a table is shown representing data generated with the PDA. A table with the protocolled behaviors is generated for every individually observed object. Below the table you can alternate between the different objects under observation by pressing the different register cards containing the subject’s names. In the task bar of the program window, different information concerning the experiment is displayed (start time, stop time, number of data records, file status, file path). The first column of the table denotes the time a behavior occurred (24 hour mode), the second column represents the date, and the following 14 columns indicate the type of behavior that has occurred. You can export this data to various file formats that can be found in the export menu. Experimental data is represented graphically on the analyzing page. The blue bars designate the subject’s state and the single black bars indicate the events. The colors blue and green denote the difference between a state and an event with blue representing the state and green representing the event. Different variations of blue and green indicate the different active or passive parts in an interactive behavior. Light blue indicates the active partner in an interactive behavioral state, dark blue represents the passive part in an interactive behavioral state. Standard blue indicates a non interactive behavioral state. For events, the color green is used following the same scheme as blue for states. Of course you can change these colors if you like. Below each graph the individual experimental subjects are represented on the register cards. Select a register card to switch between subjects as showed in the preceding table. You can easily compare two individual objects in the analyzing window due to the horizontal split screen. Also you can copy each chart in various file formats and you can scale the window to see more details.